The flashy colors are really intriguing. Also, a huge impact on me placing such a large bulk order was the fact that these bookmarks are eco-friendly and bio-degradable. The fact that you made these bookmarks biodegradable is just wonderful. Love how this company is eco-friendly and affordable for all. Lovely designs on these eco-friendly bookmarks. Bought them in a bulk order for all my elementary school students. Will be back to buy more in the near future. Such vivid print on the seed paper. I really appreciate the fact that these bookmarks are bio-degradable too. Flashy colors really engaged our little guys! When I explained to my students that you could plant these bookmarks they were so excited. Bio degradable bookmark is of the highest of quality. Its really a great thing all the way around. We gave all the kids in our book club these seed-paper bookmarks. After awhile they all decided to get together and plant them. It was really the sweetest thing to see. Really unique item, that truly is eco-friendly. We gave them to our students at the beginning of the year, and then planted them at the end of the year. Its a good way for them to always feel apart of their class. When we have events at the library we give these bookmarks out to all the kids that attend. We can promote earth-awareness and give out a neat gift. Who would of thought? A bookmark that you can plant. Great idea. Wonderful premise behind this eco-friendly bookmark. It really is the true meaning of going green. A great idea to promote reading and earth-awareness at the same time. If your a teacher of young kids, I highly recommend this. Huge hit in our elementary school. Couldn't be happier with these eco-friendly bookmarks in hand. They really look amazing. 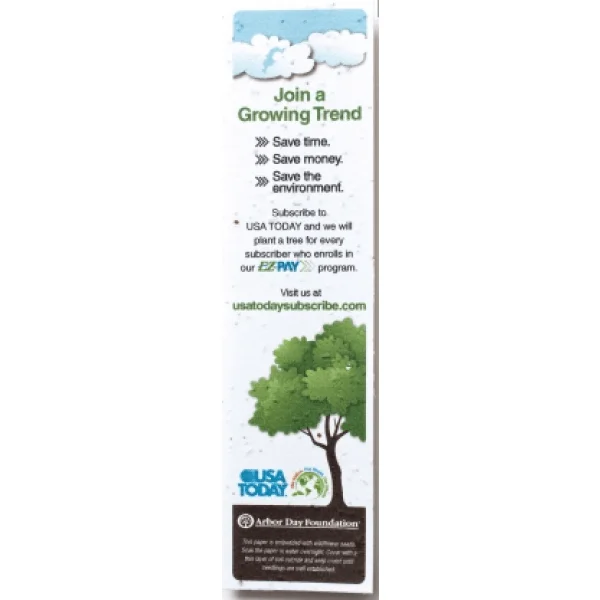 Grow your business and establish a blooming connection with your customers that is rooted in planetary preservation with Seed Paper Bookmarks. At Custom Earth Promos, we've watched consumers evolve to continuously place greater value on brands which utilize eco-responsible ethics, making sustainable products a social responsibility for succeeding businesses of tomorrow. Brands must define and deliver a social and ecological value to earn brand trust from their consumers and stay ahead of their competition. Most importantly, that value must be effectively communicated to customers and prospects. 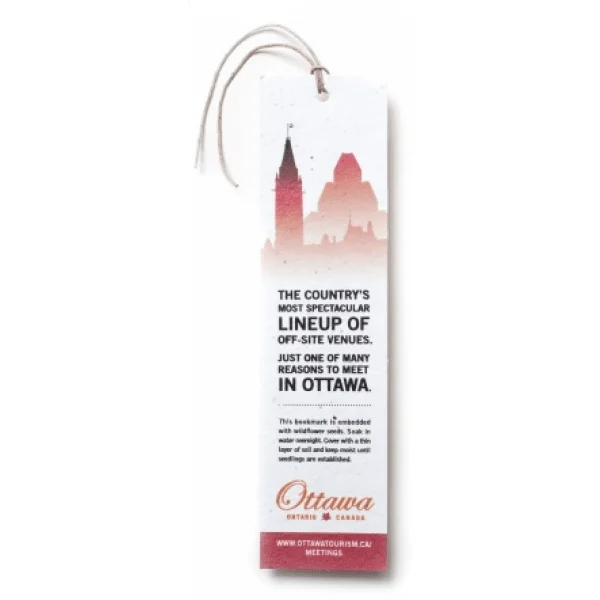 With our ready-to-plant seed paper bookmarks, you boost your brand image with an eco-friendly association and create a sincere connection with your customers. Encouraging your target demographic to take action with you is a selfless, yet highly effective way to gain brand trust and increase loyalty. Soon after your customers have planted their seed paper bookmarks, handmade from 100% post-consumer recycled material, the hardy mixture of annual and perennial wildflowers will flourish into a bold and beautiful garden. Long after your current promotion has ended, customers will be reminded of your brand message and eco-friendly mission. 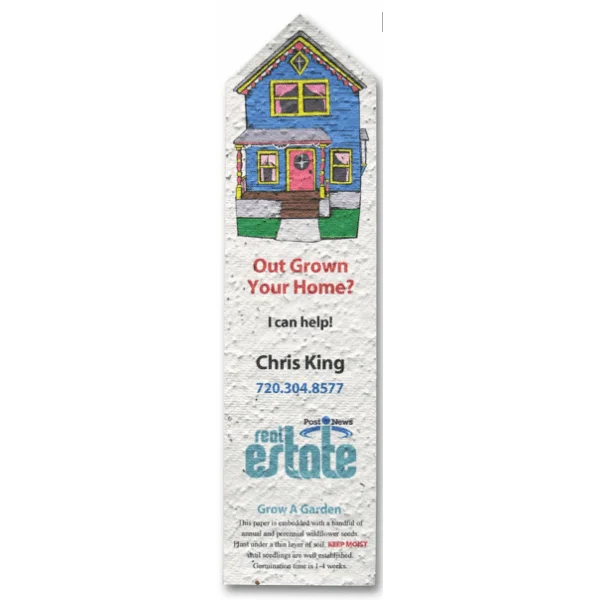 Invite your target demographic to join you in a simple, yet profound act that reduces waste and brings benefit to the ecosystem with Seed Paper Bookmarks from Custom Earth Promos. We provide absolute freedom to our customers, empowering their advertising efforts with the ability to customize each and every aspect of their bookmark order. This makes our effective, eco-friendly seed paper bookmarks an excellent and affordable advertising tool for customers of all industries. Work directly with our in-house design experts to build a brand exclusive design that guarantees to enhance the impact of your current campaign. Define the custom graphics that will most accurately convey your message and brand aesthetics to be presented on the beautiful backdrop of our thick, textured seed paper. 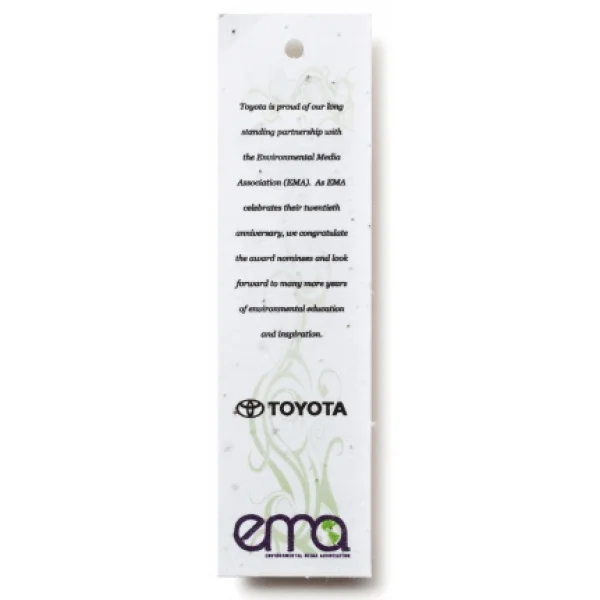 Invest in the eco-responsibility of your brand image by advertising your message on this planet friendly bookmark, a venture that will pay off in spades through gained brand trust and long-term profitability. 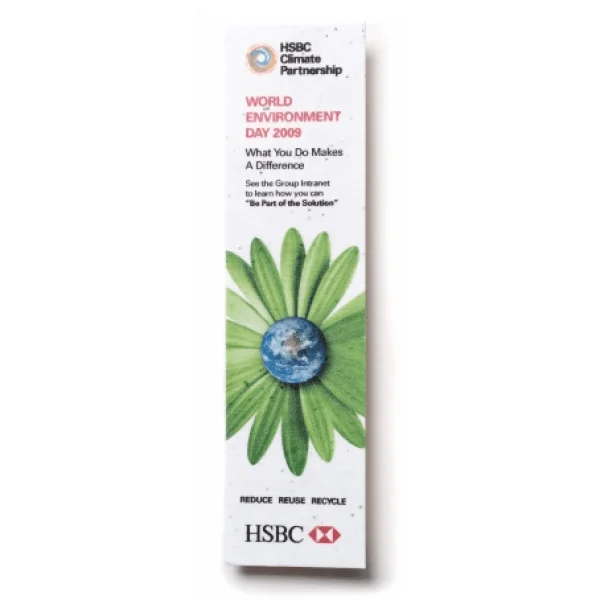 Formulated to grow in any US climate zone and infused with our top-performing hardy blend of annual and perennial wildflower seeds, Seed Paper Bookmarks make effective, interactive advertising tools for brands who want to promote sustainability and strengthen their image. Connect with your customers and give life to your message with an eco-elegant presentation, ready to bloom into bold, beautiful flower gardens. The Custom Earth Promos team carefully monitors each and every eco-ethical phase of production, using only seeds that USDA-approved and guaranteed GMO-free with the highest yielding germination rates to ensure optimal growth. Seed paper bookmarks are made in the USA from 100% post-consumer recycled materials, guaranteed to be free of any potentially dangerous chemicals. By manufacturing all seed paper products in our 30kW solar-powered facility, we proudly eliminate any potential damage to the environment. 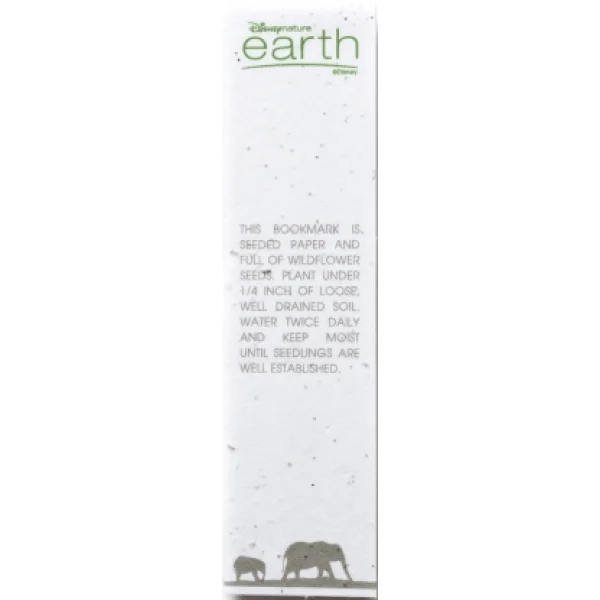 Seed Paper Bookmarks are the perfect testament to establish your brand as socially and ecologically responsible. 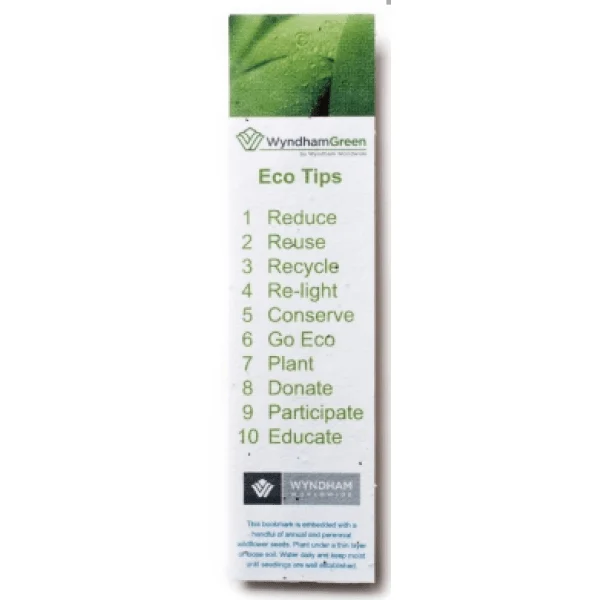 With complete freedom to customize color, graphics, and printing techniques, our eco-friendly bookmarks are adaptable to meet the needs and match the aesthetics of your business, charity or cause. Our dye is derived from 100% natural soy-based pigments, meaning that not only do our bookmarks eliminate eco-impact, but also provide a great benefit to the environment when planted. When these native plants grow, they eliminate maintenance, watering, mulching and other resources that are required to sustain the surrounding vegetation. Expert in-house design experts will work with you to define an optimal imprint graphic, seed paper color and even an alternate seed mixture to most accurately and attractively convey your message. We have a lot of creativity blooming in the factory, with new special/seasonal seed mixes sprouting year round. Promote a 4th of July event with an 'Independence Day Mix' of red, white and blue flowers, celebrate Halloween in spooky style with our festive 'Pumpkin Seed Mix' or help to spread breast cancer awareness with the 'Hope Mix' of pink annuals and perennials. 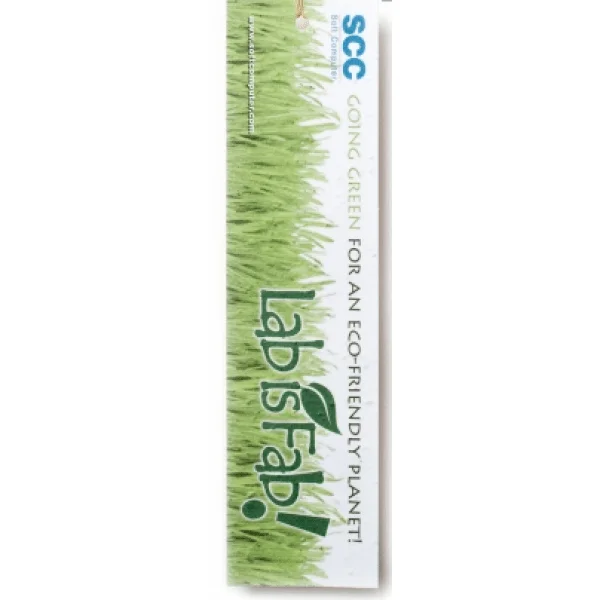 Meet your advertising campaign goals while simultaneously promoting the admirable and eco-conscious core of your brand with Custom Earth Promos' 100% recycled, recyclable and biodegradable seed paper bookmarks.